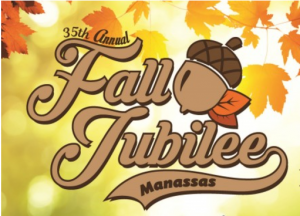 The Annual Fall Jubilee, in Historic Downtown Manassas will be held on October 7, 2017 from 10:00 am until 5:00 pm. This year’s Jubilee will include an assortment of fun for both kids and adults with over 100 crafter and community booths, live music and entertainment, and more! The Fall Jubilee is free to the public. Bring your family out for a day of fun – play games, shop at unique crafter booths, pick out your pumpkins for fall, and so much more!